A message of kindness attributed to Gandhi serves as a reminder to live life with intention. "Be Truthful, Be Gentle, Be Fearless." Hand-stamped on three simple sterling silver bars, this message of kindness attributed to the peaceful activist Mahatma Gandhi serves as a reminder to live life with intention. This necklace is finished with a delicate chain for everyday wear. For a thoughtful friend or loved one entering a new stage in life. Handmade by Christine Street in Los Angeles, California. Chain broke after one time use! After one wear the chain broke, dropped to the floor and was eaten by my dog!!! Expensive vet bill later I was able to save the charm but now have no chain. Please replace! Just lovely! The words speak to my heart. Very nice for everyday or evenings out. This necklace was such a great idea and design. 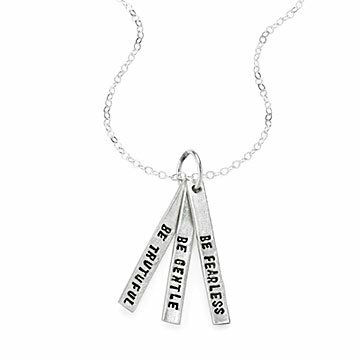 Just so sad that the words which are the whole point of the necklace, are so hard to read. Sad. The tags with the words on this necklace are so small you cannot read the words easily, so the whole point of the necklace is lost. I would definitely purchase this necklace again! I love it! 2nd favorite piece!